If you want to create a social network, you should know your goal. It’s the same as hosting a party. There should be an idea behind it. If you don’t know why you are inviting people to your party, how should they know? They will simply not show up. That’s why you should be original and trustworthy. It’s crucial to define social networking in order to plan your next steps. If you want to build social network that brings people together, you should be persuasive with your goal. Pick the theme or niche you want to develop and stick to it. Why should people join my party, not somebody’s else? When you want to make a social network, the clear purpose is crucial. Your guests should know why they are going to join your party: even when they are coming just to hang out. If you want to create a successful social network, set the mood. Remember when you came to the parties where you did not know anyone? There will be some party animals will go and hit the dance floor, the other will be shy wallflowers. Your goal is to make the last ones go and dance. The same happens when you create social network – people should feel they came to the right place. In order to make them feel so, let people know straightaway, what your network is about. Be as specific as possible, add tagline, description and logo, if you have one. Your social network style should be polished but not perfect. You don’t want people to be afraid to dance on your pure crystal floor, do you? Before you launch your social network, you should invite people to help you kick the things off. And what to start with if not with the pre-party? The folk who comes is critical for a successful start. For your online community, start with the people you know. It will be a small pre-party, but you can be sure that you trust all the guests. They should be people who came there not only for the free drinks. They should know there is an idea behind your social network, and, what’s most important, they have to believe in it. Don’t forget about search engine optimization to build a social networking site that can be easily found by Internet users – search engines also take part in that party. When you think how to create a social network, put all the above on your list and thoroughly work on each point. The guests should see that the door to your social network is opened. Nobody wants to knock on the door without any result when the loud party is happening inside. Thinking how to create a social network that keeps going? Make sure you turn on the music, keep the drinks flowing, and let people crash on your couch. Your guests need the action – give it to them. What is social networking site if there are no new discussions, posts or any other updates? Keep posting new photos, videos and other engaging content, even if on the very beginning you will be the only one who is doing it. Sacrifice a lot of time to your social network and try to come there as often as possible. Check out what’s happening there and don’t let it fade away. Don’t let the guests leave the party in a couple of hours. Prove them it’s a great place to stay. Persuade them in your originality, suggest something they cannot find on other parties and make them feel special. Think about it when you design a social network and when you are working on its content. From the moment people visit your online community for the first time they should become assured they found what they were looking for. Chances are, your success may not come right away. All the social networks made their way till they gained their big online community. It may take you weeks or months till you see the first results, but you should not stop working on it. Experiment with the tagline and network description, and create engaging content – then look at people’s reaction to it. Did you notice people are leaving the party? Then you are doing something wrong. Don’t be afraid to try something new in your social network, and ask the members of your online community to help. Make them feel like they are the ones who are making this party going. If you think how to start a social network, you have to foresee some problems. It’s the same as in any party – it’s impossible that everything goes as you planned. Expect party crashers, then the police. Otherwise, is it even a party? The same with your online community. There will be definitely spammers, hackers and other creeps. And the more you develop your social network, the more of them will be there. But you are a great host, aren’t you? That’s why your task is to kick out those guests who step out of line. And not only you, but your guests need an opportunity to easily detect such party crashers. When you launch a social network, try to monitor your members and control if there are no problems with the content. Remove, if necessary, harmful content that may cause problems to your social network and to the members of your online community. Sometimes the social network platforms offer service that helps to control the content. Then, when your online community is growing, you can hire people who will do this monitoring for you. Your task is to make sure all members of your community adhere to the rules and policy you outline. And after the party is over… Ah, we forgot to make a small remark. 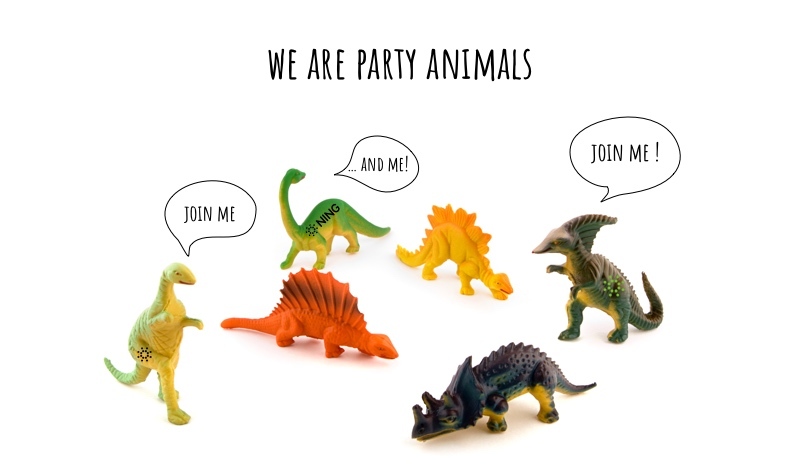 Building your social network is a never-ending-party. There will be periods of excitement, of despair and some hangovers from time to time. Ally is a Content Manager in Ning. thanks for the great post Gina! My social presence is becoming ever more important as my career matures believe it or not! I will take this on board as discuss it with my website company. Hi, Reina. The video you saw (and the blog post you are commenting on) is from three-and-a-half years ago, when we did offer a free service. We no longer offer a free service, but I hope you will consider trying out one of our plans. Looke like a well strucured method. I think that finding a good original idea nowadays can be a little too difficult. Step one is always important. The important part is making sure its something you like and enjoy. Because, if not, you will not keep at it and become bored very quickly. I love this post, it is very informative, and very correct. People, anyone really, always has something to say. Whether it about politics, hobbies, school or even work. This article was really helpful. Thanks. Awesome! Should have read this sooner but still nice advice!